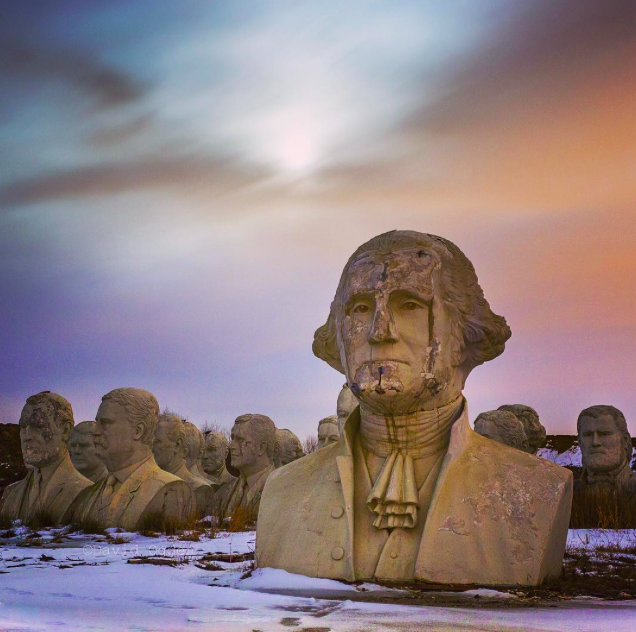 Nearly every single President of the United States, from George Washington through George W. Bush, sits in a dead field in Virginia, some with the tops of their heads blown off or streaks of dirt streaming down their cheeks, looking rather war-torn. Stark white and silent, they wait for what will likely be their ultimate fate: total destruction. 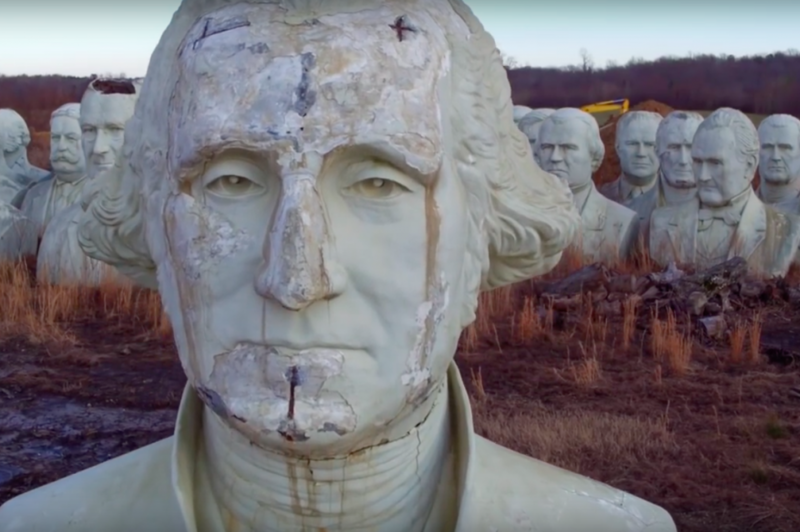 The 43 crumbling statues were saved from demolition after the closure of Presidents Park in Williamsburg, Virginia in 2010, and now drone footage has captured them in their current state of purgatory. 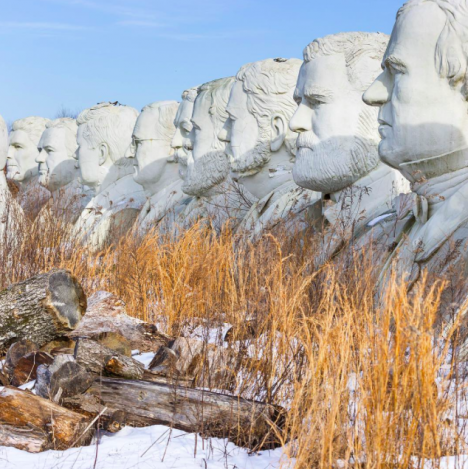 A man named Howard Hankins was reportedly tasked with destroying the statues when the park shut down after six years in operation, and couldn’t bear to go through with it. He had them moved – at a cost of $50,000 – to his farm in the small town of Croaker, about ten miles away. Most of the damage to the twenty-foot-tall statues was sustained during the move. The field is private property and not open to visitors, but Hankins did allow one drone operator access to take this stunning video. Weighing up to 20,000 pounds each, the statues were a challenge to relocate. The tops of the their heads had to be cracked so a crane could hook onto the metal frame inside each one to move them, and some sustained neck damage as they were lifted. Once in place, they continued to peel and crack. Ronald Reagan bears the scars of being hit by lightning. 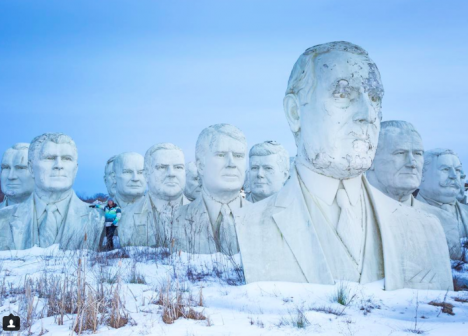 Their presence in the field is a bit eerie, especially when the landscape is icy, as captured by photographer David Ogden of Abandoned Earth. It’s hard not to see them in a post-apocalyptic light, imagining them crumbling to dust as a symbol of a culture destined to fall – our version of the ruins of Rome. But at this rate, it doesn’t seem like they’ll be around much longer. 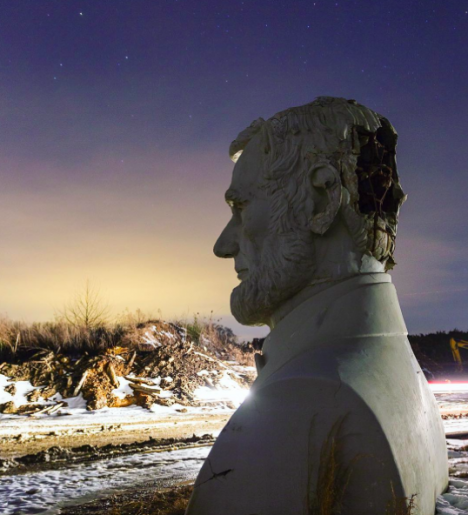 An attempt to raise funds to preserve them hasn’t mustered any more enthusiasm than the Presidents Park did when it was a tourist attraction tucked behind a motel, too far from Williamsburg’s more popular sights.